Business operations have become more mobile than ever. New and advanced business applications have also created demand for faster VPN performance, which legacy fi rewall and UTM appliances cannot satisfy. To keep up with the dynamic business environment, business networks today need to provide branch offi ces, chain stores and mobile employees faster remote access to headquarter resources. Moreover, they must do so without exposing company resources and customer information to threat and data breach. Zyxel’s new ZyWALL Series VPN Firewalls are business-grade VPN gateways purpose-built to deliver the fastest performance for multi-site VPN deployments. These high performance VPN Firewalls feature multi-core CPUs and are fi ne-tuned to deliver ultra-fast performance with up to 3.6 Gbps fi rewall and 800 Mbps VPN throughputs. The new ZyWALL Series VPN Firewalls also feature the most advanced VPN functionality—SHA-2 encryption, VPN HA and L2TP—for more secure, more reliable and more mobile VPN connectivity. The new ZyWALL Series VPN Firewalls are designed with multi-core CPUs to deliver the fastest VPN and fi rewall performance on the market. High-speed networking performance is guaranteed with up to 3.6 Gbps fi rewall throughput and 800 Mbps VPN throughput—up to 9x the fi rewall performance and 4.4x the VPN performance of preceding models. Designed with completely new and advanced hardware platforms, the new ZyWALL Series VPN Firewalls deliver uncompromising performance for high-speed site-to-site and client-to-site VPN applications. Faster processors today have greatly boosted the capabilities of attackers to decrypt VPN tunnels. Legacy VPN encryption algorithms like Message Digest 5 (MD5) and Secure Hash Algorithm 1 (SHA-1) are no longer suffi cient to guarantee secured external communications. Supporting the more advanced Secure Hash Algorithm 2 (SHA-2), the ZyWALL Series provides the safest VPN connections in its class and ensures maximum security for business communications. To support dynamic, mobile business operations in today’s BYOD (bring your own device) business environment, the ZyWALL Series VPN Firewalls off er unlimited business mobility with Layer 2 Tunneling Protocol (L2TP) VPN for mobile devices. The ZyWALL Series supports L2TP VPN on a wide variety of mobile Internet devices running the iOS, Android and Windows mobile platforms. Virtual private networks provide businesses a secure and convenient way of sharing company resources with partners, customers, or employees on business trips. Yet typical VPN solutions are hard for non-technical users to confi gure, which greatly reduces their usability and convenience. 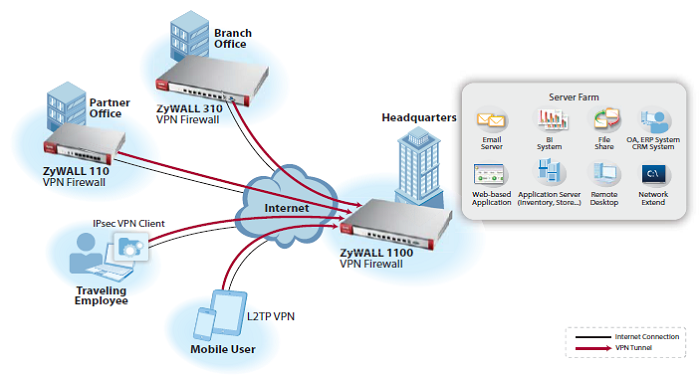 The ZyWALL Series VPN Firewalls feature Easy VPN to provide auto-provisioned client-to-site IPsec VPN setup. A wizard is available with the Zyxel IPsec VPN client software that automatically retrieves the VPN confi guration fi le from the remote ZyWALL VPN Firewall and completes the IPsec VPN setup in 3 simple steps. Zyxel’s Easy VPN lowers administration eff ort and allows partner, customers, or traveling employees to access company servers, email, or data centers easily and securely. Power input 100 - 240 V AC, 50/60 Hz, 1.3 A max. *1: Actual performance may vary depending on network conditions and activated applications. *2: Maximum throughput based on RFC 2544 (1,518-byte UDP packets). *3: AES VPN throughput measured based on RFC 2544, using UDP traffic with 1,424-byte packets. *4: Maximum sessions measured using the industry standard IXIA IxLoad testing tool. Download the Zyxel ZyWALL 310 Datasheet (PDF).